TORONTO, April 4, 2019 /CNW/ - Anaconda Mining Inc. ("Anaconda" or the "Company") (TSX: ANX) (OTCQX: ANXGF) is pleased to announce results from four diamond drill holes drilled as part of a metallurgical test program (the "Metallurgical Drill Program") to support the ongoing Feasibility Study for the Goldboro Gold Project in Nova Scotia ("Goldboro"). 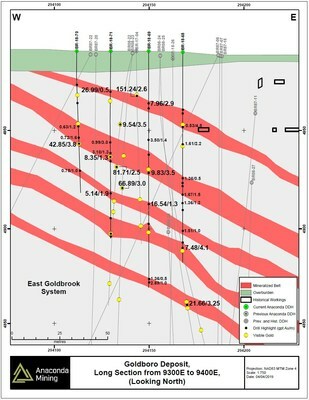 The Metallurgical Drill Program focused on an area of the East Goldbrook Gold System ("EG Gold System") over a strike-length of approximately 80 metres where numerous shallow, high-grade mineralized zones were previously intersected (Exhibit A). The Metallurgical Drill Program consisted of four HQ diameter diamond drill holes (BR-18-68 to -71) totaling 545 metres, which successfully intersected previously modelled mineralized zones, encountered five occurrences of visible gold, and confirmed the continuity of several high-grade zones up to 40 metres (Exhibit B). 16.54 g/t gold over 1.3 metres (105.0 to 106.3 metres) including 26.53 g/t gold over 0.8 metres in hole BR-18-69. A table of selected composited assays from both recent and previously reported drilling are shown in the table below. 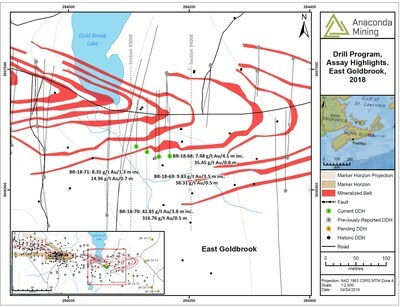 "These drill results are important as they provide confidence in the existing resource and geological models of the EG Gold System, confirm the continuity of grade for several of the high-grade zones encountered in previous drilling, and provide the samples necessary to advance metallurgical testing to support a Feasibility Study at Goldboro. The results are consistent with those we have encountered in other areas of the EG Gold System and will be incorporated into an updated mineral resource estimate, which will include 10,000 metres of drilling conducted since July of 2018 and is expected to be released by the third quarter of 2019. In the meantime, we continue to work on an additional 5,000-metre drill program to better outline high-grade zones in the EG Gold System, expand the deposit, and infill specific portions of the EG and Boston-Richardson Gold Systems." ~Kevin Bullock, CEO, Anaconda Mining Inc.
9.54 g/t gold over 3.5 metres (50.0 to 53.5 metres) including 27.60 g/t gold over 0.5 metres in hole BR08-22. Mineralized intervals from the Metallurgical Drill Program assaying greater than 0.5 g/t gold were composited and sent for analysis to BASE Metallurgical Laboratories Ltd. of Kamloops, British Columbia. A separate sample collected from the Boston-Richardson Gold System during the recent underground bulk sampling program was also composited as part of a larger metallurgical sample (the "Metallurgical Sample"). The Metallurgical Sample is being used in a suite of tests designed to better characterize the recovery and milling properties of mineralization and to optimize the process flow sheet as part of the ongoing Feasibility Study. Anaconda Mining is a TSX and OTCQX-listed gold mining, development, and exploration company, focused in the prospective Atlantic Canadian jurisdictions of Newfoundland and Nova Scotia. The Company operates the Point Rousse Project located in the Baie Verte Mining District in Newfoundland, comprised of the Stog'er Tight Mine, the Pine Cove open pit mine, the Argyle Mineral Resource, the fully-permitted Pine Cove Mill and tailings facility, deep water port, and approximately 9,150 hectares of prospective gold-bearing property. Anaconda is also developing the Goldboro Gold Project in Nova Scotia, a high-grade Mineral Resource, subject to a 2018 a preliminary economic assessment which demonstrates strong project economics. The Company also has a wholly owned exploration company that is solely focused on early stage exploration in Newfoundland and New Brunswick.